To begin with there is a difference in ironing and pressing. When you iron a garment, you are smoothing out wrinkles with a gliding motion. Pressing, on the other hand is lifting the iron up and down with the goal to meld the thread into the fabric, open the seams or shape the seam or other portions of the item into a curved shape. Ironing by sliding can cause distortion – pulling the fabric off grain or otherwise distorting in an unintended manner. Allow the fabric to cool before moving on, as hanging moist fabric over the edge of the ironing board can also distort the fabric as it cools and dries. Match your iron settings to your fabric – test if you have delicate or expensive fabric. Jami’s hint is before you do major shaping or seam pressing – do a fit check – don’t press in a seam that needs to be modified. But also to press as you sew. Plan out your pressing for a quilt. Some patterns will come with instructions to sew a group of pieces together and then press all of the seams in a specific direction. Usually quilt seams are pressed to one side so that when the next block or piece is added the seams lie in opposite directions to reduce bulk. There may be specific times when a seam is pressed one direction or another. For example the seams may be pressed to the darker fabric when they might shadow through a light one, or pressed open if the quilt is made from a heavy fabric like a denim. There are different techniques and specialize products that make the job easy. Iron specifics – For sewing efficiency, have your iron on and close to your sewing machine. I love to have the option of lots of steam. My weapon of choice is a Pro Rowenta with a side tank that doesn’t require cooling to refill. The gravity fed irons carried locally by Fabrique are also highly recommended. 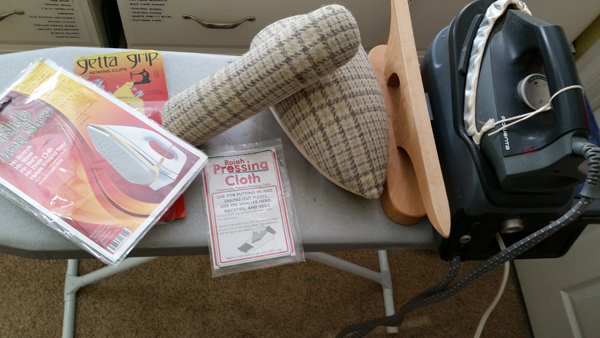 If you are creating large items like quilts, you may want to consider an ironing board topper like the brand “Big Board” that extends the width of the board and the shape to be rectangular. There are also specialty ironing board and iron covers as well. A local quilt shop Stitched with Love-McKinney, carries the Bo-Nash Iron Slide covers and iron shoe. These are available in different ironing board sizes. Your fabrics will be safe from iron damage with these products. Pattern prep – I always press with a dry iron, the tissue paper patterns to remove wrinkles and allow for more accurate fabric cutting. If you do pattern alterations use a non melting tape. Marla Kazell recommends 3M’s micropore . Iron Tools – When sewing a seam, first press the seam closed. This allows the seam thread to meld into the fabric. Then generally for a seam, it will be pressed open. Some areas will require a form of some sort to create the correctly shaped curve or to allow access to the seam. Tailor hams, sausages are fabric forms that have wool on one side and cotton on the other. They are generally stuffed tightly with sawdust. Sleeve boards are both fabric and wood. Point board pressers, tailor clappers, and seam or strip stick are wood devices to allow you easy access and control of a seam by their size and shape or a clapping action to flatten a seam. Pressing Cloths – A Rajah cloth is a chemically treated cloth that will either set a pleat or crease or remove one. This notion is available from multiple sewing related stores. On your next visit to Fabrique , pick up a 1/4 to 1/2 yard of cream or white 100% SILK organza. Cut or tear into pressing cloth sized pieces, it is sheer enough to see through and will protect your delicate fabrics. Louise Cutting recommends having one dedicated for use in pressing iron – on interfacings. (Silk organza also makes great underlining and interfacing) When creating with corduroy or velvet, you must use a velvet pressing board or mat. These will keep the nap of these fabrics from crushing or becoming shiny. On a side note – you can use this characteristic of velvet to make embossed patterns by using large rubber stamps and your iron. Check out this Threads article for specifics. And finally, there are some fabrics that cannot be pressed. Leather seams (and other skin type fabrics) are generally flattened with a seam roller or a mallet and then glued down with a rubber cement. Vinyl, oilcloth are other fabrics that don’t like to be ironed. Use clips like the Clover or Getta Grip Sewing clips instead of pinning and to mold the seams open with or without adhesive. What is your favorite pressing tip?